Don’t you hate it when you get the perfect pair of shoes only to discover that they are too tight on your feet? Sure, they did seem to fit when you tried them on at the department store, but after wearing them for a few hours, you realize that they are actually uncomfortably tight. This does happen. If you can’t return the shoes—or don’t want to—there are ways you can stretch them out to fit. Here are several. If you want to shell out a few bucks, take your shoes to a local cobbler, where they can be stretched out to your liking. If your town doesn’t have such a place, ask around at the local department stores to see if they provide the service or can refer you to a place that does. Going this route does require some time and effort on your part. There are some other ways you can try to stretch your shoes that won’t cost you anything. In order to be able to wear those shoes for long periods, such as all day at work or all evening at a social gathering, you’re going to have to make them more comfortable. Wearing the shoes at home for short periods will help loosen the material and stretch out the shoes. When the shoes hurt your feet, just take them off. 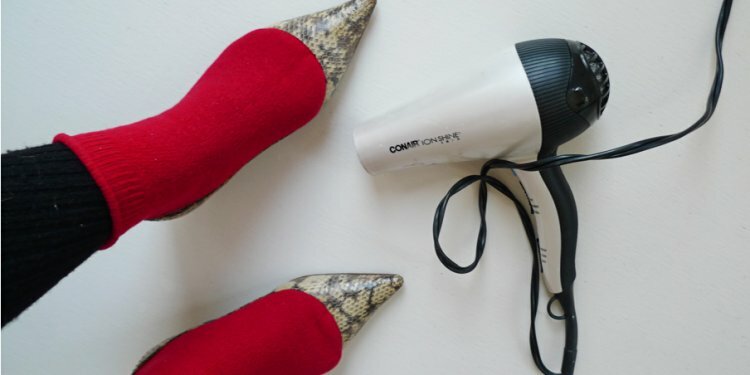 To speed up the process, wear a thick pair of socks—or several pairs—before you stuff the shoes on your feet. An alternative to stretching out the shoes with your own feet is to insert other items into your tight pair of shoes. Try over-stuffing socks into the shoes or crumpled up newspaper. A number of shoe-stretching tools are out there specifically for the purpose of stretching out shoes. Shoe stretchers can adjust the length as well as width of a shoe. Knobs can be turned to adjust the stretcher. Just be careful not to get the shoe too loose. Shoe stretchers can work fine but will cost you maybe $20 or so. We have all heard that water expands as it freezes. Well, freezing your shoes also expands them. All you have to do if fill a sandwich bag for each foot with water about 1/4th full. Insert the bags up into your shoes, stick them in the freezer and leave them there until the water freezes. Once it does, allow it to thaw, take out the bags, and try on your shoes. If one round of freezing doesn’t do the trick, try a second time. This method can be a little tricky, as you will need to make sure the water doesn’t leak when put inside the shoe. For shoes (such as canvas) that can get wet, however, freezing the whole shoe can work as well. Get the whole shoe wet, add the water inside, and freeze it all. When everything thaws out, hopefully you will have a shoe that fits.